If you're looking for a complete set of skincare products with the whitening element as a plus, you'd love the Bench Perfect Skin Whitening Kit. The set includes a full set of skincare items you can use on budget. It's just over Php 200 in price. Start with the facial wash which you should use like any other facial wash product. Squeeze a pea sized amount on one finger, lather with water, and wash onto your face and neck while scrubbing it in a circular motion. Rinse with water. Pat dry. Next, apply the toner by dabbing it onto your face a through a cotton ball. The moisturizer and serum follows after. It's applied liberally through your fingers, making sure it's applied all over your face. 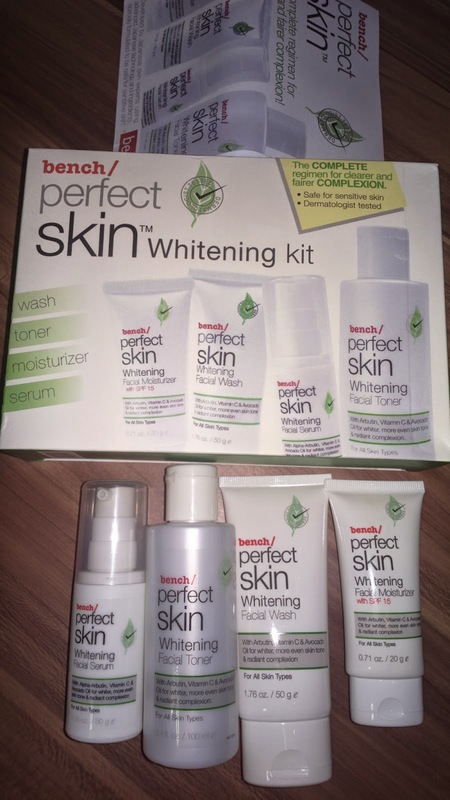 Enjoy your very affordable complete skin care whitening product from Bench!